Do certain images attract your attention to a cover? 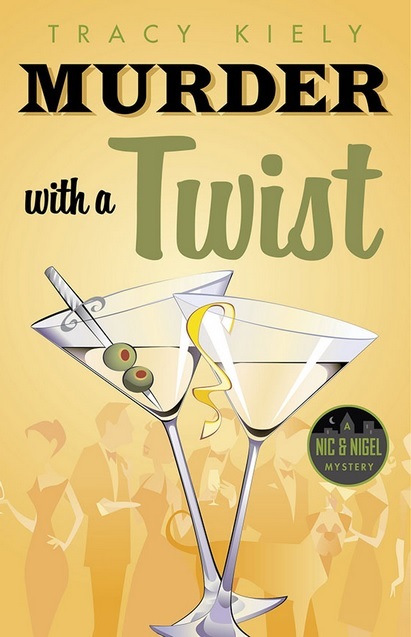 Considering the name of my blog, The Poisoned Martini, it’s not surprising that cocktails on a mystery cover would catch my eye. Here, front and center, we have two martinis. I like to think of them as a gin martini with olives and a vodka martini with a lemon twist. My attention then shifted to the background image with its dressed up crowd at what appears to be a black tie affair. The hazy golden glow of the cover and the green in the title blend nicely with the colors of the cocktail garnishes and adds to the overall effect. Third, I noticed the black and green circle and its cityscape announcing this was a Nic and Nigel mystery. This is the first in a new series by Anglophile author Kiely. Readers may be familiar with her Jane Austen themed mysteries, featuring sleuth Elizabeth Parker. Murder with a Twist would appear to be inspired by Dashiell Hammett’s Thin Man series starring married couple and detective duo, Nick and Nora Charles, icons of wit and banter with a bit of snark. The overall effect of the cover interests me as a reader. The back cover description, however, is somewhat lacking. The focus seems to be on the missing “married bachelor” with barely a hint of something “deadly.” I would want to know more about the book’s murder up front, but I’m still willing to read to find out. How do you choose what gets added to your reading list? Reviews? Word of mouth? Familiarity? Or by its cover? Follow along as The Poisoned Martini takes a look at book covers that catch the eye in the ongoing “By Its Cover” feature. And for a look at more classic and contemporary book covers, check out my sister site, The Poisoned Martini+, for a more visual approach to looking at the mystery and fantasy genres.